As the wisdom of the age goes, there are no final victories in politics. 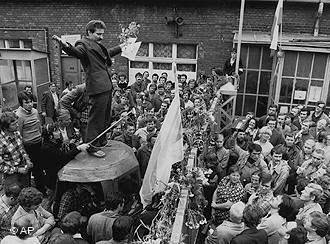 When the leaders of Poland's Solidarity movement (Solidarnosc) sat down with the long reviled Communist Party authorities to hammer out the timing and logistics of a genuinely contested election, however, they were faced with a most peculiar anomaly: a victory so final that even their enemies willed it. In the end, the totalitarian world was finished off not with a bang but with a firm handshake and an international press release. Realpolitik trumped idealism in an apparent validation of the old adage that politics is "the art of the possible." The enemies of Solidarity - in the form both of the deep state calcified over decades of Communist Party rule and Soviet foreign policymakers - may have been obliging in the end, but the victory, and Solidarity's subsequent pacification, was the product of the movement itself along with its internal conflicts. To transplant a phrase of Rousseau's to a very different context, where the intensity of clashing interests makes social movements necessary, the agreement of those interests makes them possible. Invariably, a social movement is comprised of internal factions with different aims and different methods of achieving them. What longevity the later consensus achieves cannot be determined normatively, but is subject to the particular differences internalised at the outset. This internalised heterogeneity is at once strength and weakness. Inevitably, social movements must become acquainted with one form or other of defeat. The question is always, defeat of what kind? In the case of Solidarity defeat took the form of an encroaching respectability, one which allowed a centralised leadership eventually to make peace with the crooked, authoritarian regime. The Solidarity movement had formed in 1980 in the wake of price hikes by the central government on basic foodstuffs, undertaken in a delayed and inadequate attempt to restrain economic pressures emanating from indebtedness to the West. In a process that I have described as "contradictory subsumption" of the Polish Party leadership - and its extended network of economic stewards and institutional cronies - within Western financial markets, the centrally-managed economy and the so called "socialist basis" of production was being undermined from within. Solidarity took shape against this backdrop of a self-reinforcing debt trap and the consequent internal transformation of the functionality of the Polish state. The movement was based not on a unitary, organised class or class-political ideal (as the Communist Party had, in its own distorted way, once been), but on the mutual recognition of an overlapping space of interests by all those who, for whatever reason, opposed the regime. To return to Rousseau, heterogeneous social strata were brought together through recognition of a single "common element." Opposition to the communist regime, once recognised, became a binding "social tie" of the movement. The key question is, then, whose interests were counted in the movement of 1980-81 and how evenly or unevenly were they weighted? Cemented by an initial, astounding set of concessions following the 1980 strikes, the movement managed to recruit ten million members in its first year of existence. Already the most bullish voice in the now formal civic opposition, Lech Wałęsa said: “We have achieved everything that was achievable under the circumstances. We will achieve the rest as well, for we have what’s most important: our independent, self-governing trade unions. This is our guarantee for the future.” Wałęsa and other worker-dissidents, among them Andrzej Gwiazda and Anna Walentynowicz, had been campaigning for some time for bread-and-butter worker protection and safety issues, as well as the freeing of political prisoners. Yet the real strength of the movement came from the working class itself, which had never been fully subordinated to Party rule and had caused major disruptions in Poznan in 1956 and Gdansk in 1970. Primarily workerist in composition, Solidarity emerged out of the September 1980 conference of union delegates following the decision to form a single, national union. Whatever socialist ideology was expressed in the strikers' list of demands, it remained necessarily inchoate and, couched as it was in language acceptable to the regime, incoherent. Indeed, the communist system placed an effective block on the sharpening of ideological daggers, effectively displacing and dispersing any nascent unity of outlook. Though policy itself - from wage increases to increased press freedom - was easy to come by (the list of grievances being long; the weight of disapproval evenly shared), forming a homogeneous identity was necessarily difficult. This also worked to the movement's advantage. Though composed overwhelmingly of an industrial proletariat concentrated in Gdańsk, Katowice, Wrocław and the Mazowsze region, the emerging leadership had a distinctly Catholic flavour. This was understandable: Polish Catholicism ran deep in the cities and the countryside, and had never fully been suppressed by the Party. In part, Polish Catholicism had liberated itself by announcing early on its tactical toleration of the regime. Its survival as a truly non-communist civil society organisation was both a necessary linkage in communist hegemony and, in moments of crisis, a threat to that hegemony. Both Lech Wałęsa and his later rival, and first postcommunist Prime Minister, Tadeusz Mazowiecki were explicit about their Catholic allegiances. This made them at once acceptable to what civil society existed as well as making them comprehensible to the Party authorities. After all, a long tradition of Catholic independence had been semi-manageable, even partly incorporated into the Party's reign. In a society divested of articulate political dissent or public debate, there was little cultural space besides the Church into which Solidarity could insert its own discourse. In these new conditions, Solidarity had to lose its’ mass-movement character. Nevertheless, most of the trade union structures survived in secret, but the logic of the mass movement which had kept them animated, was shattered. Opposition leaders and activists became effectively cut off from their social base. Under these new conditions, their support came not from the factories and industrial plants, but the church. The wave of strikes and stoppages in the spring of 1988, resulting from a fresh debt crisis, was not a victory lap but a final death spasm of the original movement. By now, a centralised leadership had had time to develop a coherent ideology combining the popular appeal of the Church and deep Polish national and anti-Russian sentiment, with endorsement of hyper-modern, Reaganite free markets and liberal democracy. According to Wielgosz, liberalisation had already begun in 1987, under the communist regime. The 1989 Round Table talks completed by the Solidarity leadership and the Party merely secured a tacit agreement over the reintroduction of capitalism by the elites of the two camps. Though Wielgosz is far from completely wrong, the very heterogeneity of the Solidarity movement - with shared appeals to socialist, nationalist, and religious sentiment - made its eventual transformation into a "locomotive of capitalism" possible. Moreover, the very "contradictory subsumption" of Communist Party leaders into western financial markets meant that, in debt-laden Poland above all, authorities were inadvertently engaged in reintroducing capitalism even as they honestly struggled to maintain the authoritarian system. Only in China, where the Party formally and openly adjusted the economy to capital markets, did the regime manage to hang on to power. Otherwise, the process went on behind the Party's backs. "Solidarity," according to Frances Millard, "did not emerge from a vacuum but drew upon existing social networks and shared Polish national-religious cultural traditions." (Politics and Society in Poland, 8) The elite, though having already informally granted concessions and having brought the wolf of international finance closer to the door, had no choice in 1988 but to draw up the 'Anti-Crisis Pact', for the first time accepting the opposition into an informal co-governing position. The Party may have anticipated winning the semi-free June 1989 elections which were the result of the Round Table negotiation period, but in the end it was trounced (famously losing every contested seat bar one). The election did not reaffirm the Party's legitimacy, bringing a rebellious social opposition to heel, but in fact affirmed their irrevocable loss of stature. Tadeusz Mazowiecki, from the conservative leadership of Solidarity, was made Prime Minister in the Sejm with Jaruzelski narrowly maintaining the Presidency for the Party. Mazowiecki led a Grand Coalition from Solidarity, the Communists, and two former satellite parties. The Communists, with their eyes fixed on the Soviet Union, kept hold of the Defence and Interior Ministries. By Spring 1990, however, Wałęsa was moving against Mazowiecki in the Sejm. In the suddenly open ideological playing field, confusion reigned among Solidarity's ranks. Radical economic liberals, gradualist interventionists, political liberals, and conservative nationalists vied for position in a movement now substantially funded by the USA (see 1989's SEED Act). Not only this but the new political class assumed power during a deep economic crisis, fostered in part by the break-up of the Soviet Union and the ravages of capitalist finance. Yet in some respects there was startling consistency on the part of the Solidarity and ex-dissident leadership. Within a fortnight of the new government's formation in 1989, Minister of Finance Leszek Balcerowicz had submitted a plan to marketise the Polish economy to the IMF. In a program of merciless, government-backed reconstruction, Poland would remodel its devastated, heavy industries following advanced, western models. In a gesture of extraordinary vanguardism (contradicting the idea that neoliberalism was all about relinquishing human controls on the economy), Balcerowicz promised to skip the "middle-income" development phase and join western Europe as quickly as possible. Even the IMF must have understood the improbability of such a rapid reconstruction, though they surely relished liberalisation for its own sake. Indeed, no international body had been more important in generating financial subservience of the Socialist bloc economies and their leaderships to the West than the IMF. Balcerowicz's plan was, then, timely tribute to them. Despite the many changes of government under the democratic system after 1989, the deep liberalisation trends unleashed by the first Solidarity regimes remained pretty constant. Wałęsa, having got the presidency, installed the relatively unknown small-time Gdansk entrepreneur Jan Bielecki as prime minister, and together they stuck to the Balcerowicz path. The now familiar syndromes of economic shock therapy soon set in - harsh public spending cuts, never deep enough for international creditors; a constant cycle of public and private sector corruption; and recurrent strikes and protests. "Precisely because the Polish revolution began with a compromise," the historian Timothy Snyder has claimed, "many Poles have trouble seeing it as an achievement." It is not the compromise that leaves a sour taste, but the actors who made it and the consequences it helped instigate. As early as 1980 Lech Wałęsa was heard to maintain that, "We will have to build capitalism." The lifelong dissident and Solidarity activist Karol Modzelewski's reply was equally telling: "I wouldn't have spent eight and a half years in prison for capitalism." This month that bastion of liberal thought the UK Economist celebrates twenty-five years of Polish success, though they are careful to remind Poland of the need for further and deeper liberalisation. For a country that went further and faster than anyone else, one is left wondering if any extent of liberalisation will ever be satisfactory. The magazine sounds another note of caution: Poland will have to build new high-tech industries and services if it is to keep up with Germany and the like. It doesn't take the most historically reflective of economic commentators to realise that such an outcome is unlikely. Just as the dream that lay behind the Balcerowicz plan, the dream formulated in the shadow of Solidarity's destruction, was unattainable, so today's liberalisers will inevitably be confronted with the dead-end of "endless accumulation" and global competition. Tacitly, even the Economist is now highlighting the approaching limits of the economic catch-up regime instituted by the early Solidarity governments. When growth rates of four percent finally dry up, there will be little left for the liberal-democratic state to tout as major achievements of its twenty-five years of competitiveness.